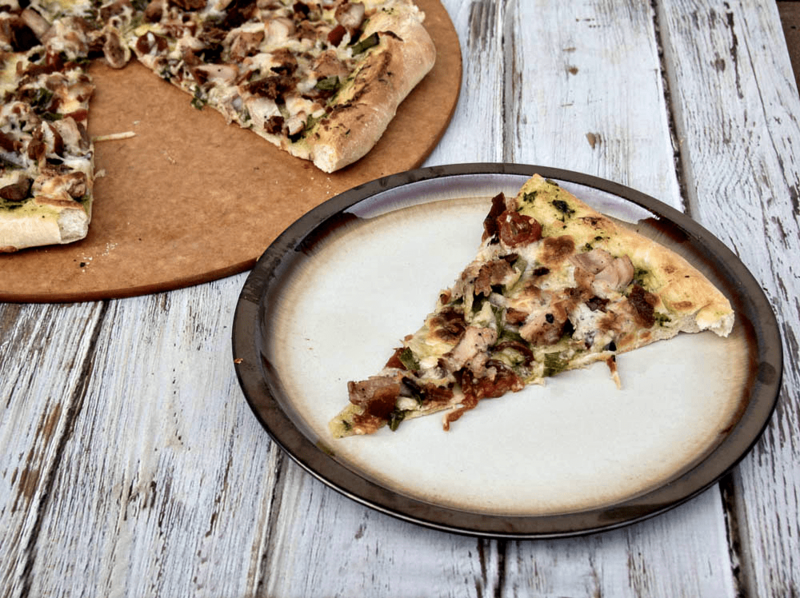 Pizza makes an good family dinner, because it is not only quick to make it is cost effective too.Â But always serving cheese pizza is boring, so I like to change it up with some different toppings. 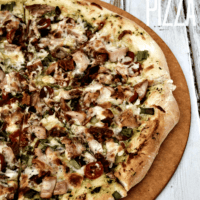 A few weeks ago I made Chicken Bacon Ranch Pizza, and the family loved it! My son had this at Scout camp and came home raving about how it was the best pizza ever. So naturally I had to try to make it, and prove I can make pizza as well as a camp cook. I used pizza dough I had in the freezer, and topped it off with ranch dressing, shredded chicken, bacon, green onions, tomatoes and parsley, covered with mozzarella cheese. My son said it was almost as good as the pizza at camp! Roll out the pizza dough into a circle. If you need to cook the chicken thighs and bacon fry them in pan until cooked. I had leftovers of both already cooked, which made this quick to put together and a good way to use up things in the refrigerator. Spread the ranch dressing around the dough up to the edges. 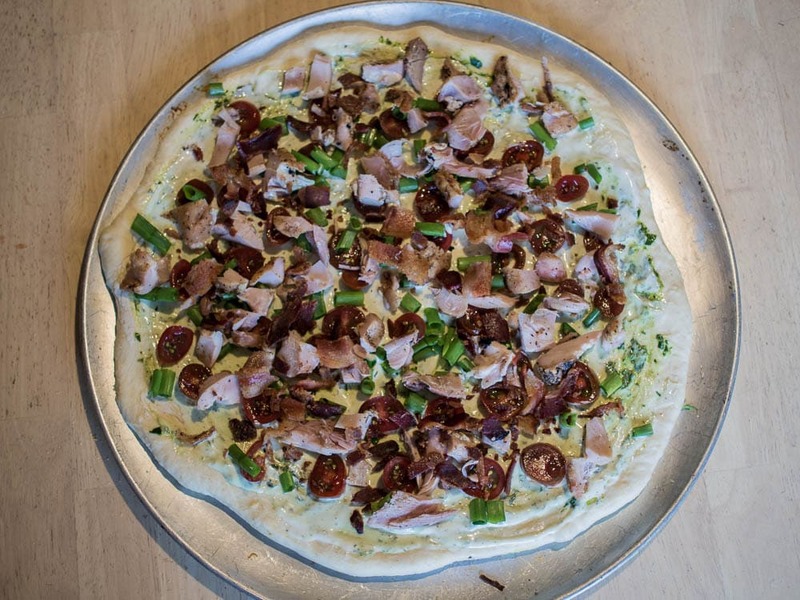 Top with chicken, green onions, cherry tomatoes, bacon and parsley. Add the cheese on top and bake for 20-25 minutes. 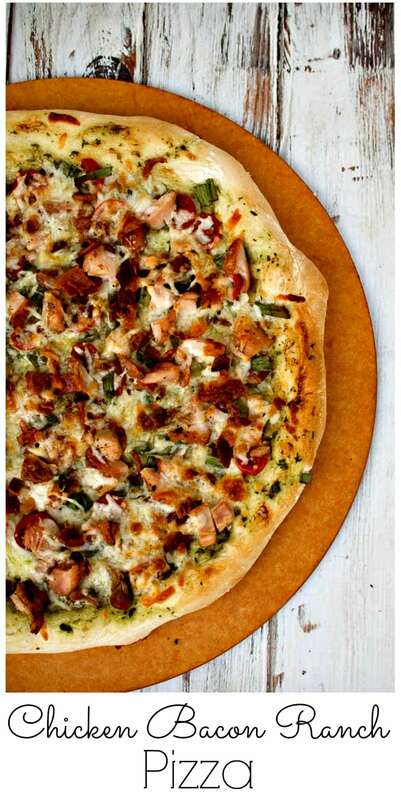 Chicken bacon ranch pizza sounds delicious. I’ll have to try this recipe. I know my husband will love this recipe. Thanks for sharing. Hmmm….I actually have some leftover chicken and bacon. This sounds like it would make a great pizza for a home lunch. Pinned. Came over from Wonderful Wed. link party and would love if you came and shared this on Merry Monday. I’m looking for recipes featuring bacon for a roundup at the end of the month. I tried your pizza recipe this weekend and my boys loved it! Thanks for sharing your recipe with us at Wake Up Wednesday Linky Party. We will be featuring your recipe at this weeks party, it was sooooo good. I’m now following you on your social sites too, can’t wait to see what you cook up next.